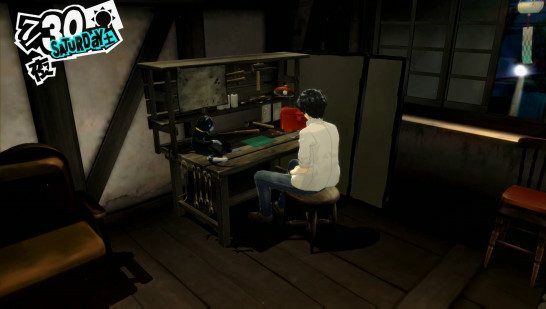 This page contains a guide on the different things the player can do in his room in Persona 5, including descriptions of each activity and their effects. A guide on the different things the player can do in his room in Persona 5, including descriptions of each activity and their effects. The player can do a variety of activities at home that improve certain Social Stats throughout the game. Some activities require the player to purchase certain items to be able to engage in them. Below are the things that the player can do at home. You can go to bed at any time, even when you haven’t done anything. However, you’ll want to spend your time actually doing something productive like improving your social links or improving your social stats rather than just going straight to bed. When you’ve bought a TV from the Yongen-Jaya Second-hand Shop, just across the street from the Le Blanc cafe, you’ll be able to rent DVDs at the Shibuya Central Rental Shop. Watching DVDs improves different social stats, depending on the movie. You can also spend time playing video games which increase your social stats as well. You’ll need to buy a game console from the Yongen-Jaya Second-Hand Shop to do this. You can improve your character’s HP by interacting with the chair at the foot of the bed. You can improve the efficiency of your training by purchasing some protein at the Rocinante Discount Store in Shibuya Central. You can create various Infiltration Tools to use when exploring Palaces and Mementos. Among these tools is the lockpick, which allows you to open locked treasure chests. Note that once you have cleared a Palace, you won’t be able to enter it again. Any missed treasure chests will be unobtainable afterward. You can check out our guide on crafting lockpicks and other infiltration tools from the links below. The large shelf lets the player view any decorative items obtained throught the playthrough. This section should also have the houseplant that increases your Kindness stat depending on the quality of nutrients you use on it.